I appreciate all the support I have gotten from this blog over the past 10 months, but it is time to pick up and move on. I’m taking my blogging experience and putting it all here! I got to the point where I felt like I needed a blog more focused on nutrition, since I am a nutrition student and have a serious passion for that area. 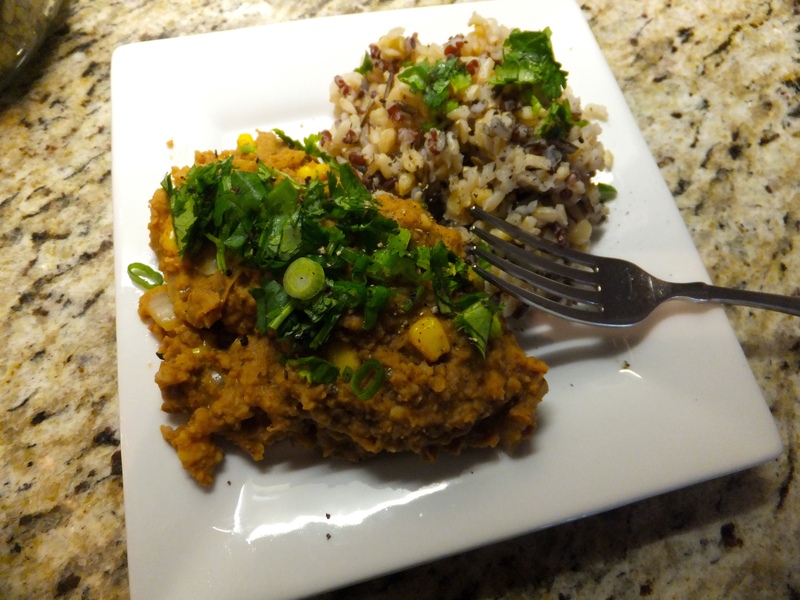 I’m trying to figure out a way to carry over some of the stuff I’ve done here, such as the once a week vegan and past recipes, so at least some of it can live on! I’m sure some of you might have noticed how my blogging fell off the consistency train a while ago, and I apologize for that. I feel like a fresh start is exactly what I need to get my going again and keep my encouragement strong. I hope all of you keep focused and on your missions even though mine has just taken me somewhere else :). And, if you want to start reading my new blog instead, I really appreciate that and your support! New to this? Check out what it’s about here. Past posts/recipes found here. I kind of hinted two weeks ago (no post last week as I was in study mode!) that I would be using beans. 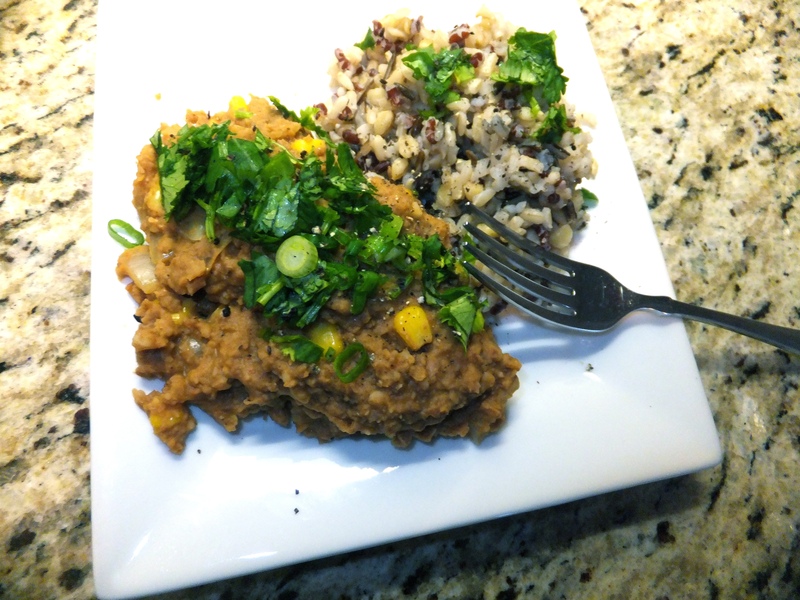 Although, I did use some, I didn’t use all that I had planned to use (ie: adzuki beans being the neglected ones). And by use I mean take dried beans, soak them and then cook them – we’re not talking opening a can here people! I did manage to successfully go through this process for black beans. If you don’t have the time to do all this prep to turn dried beans into cooked beans, I can see how much of a pain it can be. It can also be a huge pain if you forget to start the main step (ie: soaking the beans overnight because this is how long they need) to begin with – this for me was the mornings I woke up thinking ‘crap, I forgot to soak my beans last night! So, as long as you commit (and don’t forget!) to doing the prep work, you can have amazing tasting beans in virtually no time – the actual work you put into turning dried beans into cooked beans is minimal; it’s just the waiting time that takes up this time frame! And, you can’t beat the price. 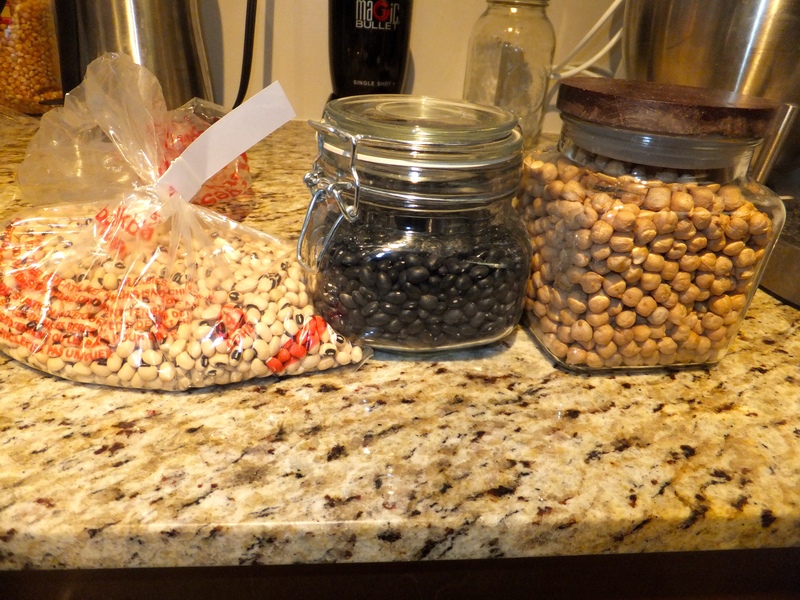 Seriously, a good cup or two of dried beans from the Bulk Barn cost me under $2.00! 1 can of beans = approx. 1.5 cups –> price can be anywhere from $1-2 depending on whether you buy generic/brand/organic/etc. Dried beans = approx. $0.33/cup vs. canned beans = $1.33/cup – so about $1 difference per cup! Now let’s get to some bean focused recipes! Not appealing? Jump to recipe #2. There is no specific way to make good nachos – they just kinda happen! The way I like my nachos may not be the way you like your nachos, so for now, I’m going to go over what works for me. There are no proper measurements – it’s all about taste! 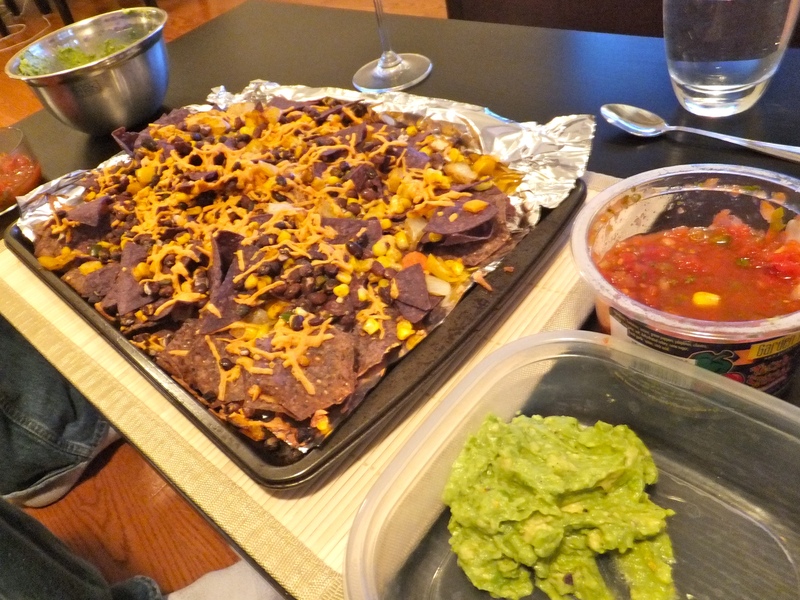 Once you get the mixture the way you want (give or take a few ingredients), spread your nacho chips out on a baking tray, add your mixture on top the of nachos (along with the Daiya cheese now) and back in the oven for 15-20 minutes at 350F. There really is no secret to make guacamole. In fact, I can hardly call my guacamole, guacamole! I basically take 2 or 3 ripe avocados, mash them up in a bowl with a fork, add some lime juice and salt and pepper. If you have fresh cilantro on hand, it’s also a nice touch to chop in, but really, avocados are so good on their own (apparently an aphrodisiac?! ), that they don’t need much to taste amazing! 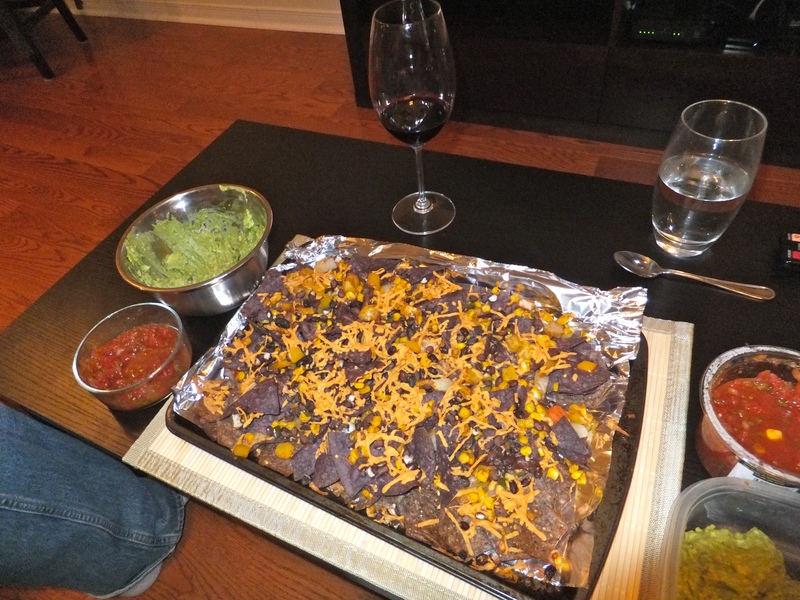 Next, enjoy nachos with some wine and husband. If you don’t have either, don’t worry, you’re not really missing out 😛 I kid! Doesn’t appeal to you? Jump to recipe #3. 1. Take your soaked and cooked beans (or canned) and place in a food processor along with 1/2 cup of water. Combined until beans are processed and smooth. 2. Meanwhile, in a frying pan over medium-high heat, place oil in plan and add garlic and onion. Fry for a few minutes. 3. Next, add processed beans along with spices + brown sugar and more water as needed. Continue cooking and stirring for 5 minutes. 4. Add in corn. Once everything is heated through, transfer to a plate. Garnish with scallions and chopped cilantro. Serve next to rice or make into a Mexican dish! Either way, they were fab…but you know what they say about beans!! You’re probably wondering how a mac and cheese made it into the beans post…well I have news for you! It contains sweet potatoes and beans – white kidney beans to be exact! Has same saucy feel to it and same tang as cheese would give to the dish. 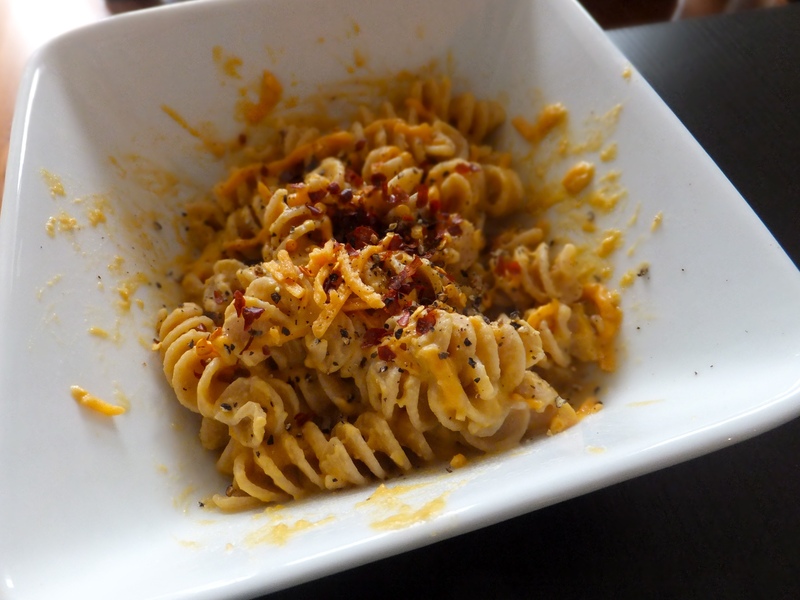 It taste delicious with vegan cheese melted on top and red chili flakes added. It provides enough to have for leftovers. To be quite honest, I can’t really compare this to other vegan mac ‘n’ cheeses because this is actually the first one I’ve ever attempted. Having said that, I’m glad it was the first one to try because it definitely has encouraged me to try more. Not only did I like it, but the husband enjoyed it too! Would I make it again? Yes, most likely, just because of how good the ingredients are (take a look for yourself by clicking on the link above), but I most definitely have another one in mind for next time! I also soaked and simmered some chickpeas this past week and have plans to use them – this dish came at the perfect time! Sorry that I didn’t post last week, but now, I can officially say I am chem free! That, along with stats, assignments, labs and questions due put me a little off schedule, to say the least. I only have one more week to make it through before going on reading week (which I’m pretty sad to say that I’m not doing anything for it), and then I will have a lot more free time! Wishing everyone a great weekend and good week ahead! Today we’re going very basic, because who doesn’t love basic?! I promise you next week won’t be as basic because I have some ideas in mind, which will then be shared next Saturday! Basically, anyone can practically make these recipes. So corny, I know. I’m not going to call them recipes this time, but meals, because they are both super easy meals to prepare! First of all…what the hell is quinoa?! It is a complete protein, containing all eight amino acids – this is great news in the protein department! Plus, it taste delicious! You must always rinse it before using it. It comes very bitter, so to rid it of all that bitterness, give it a quick rinse! –> Don’t have a fine sieve (don’t worry, I didn’t for a while either), simply take a coffee filter or even paper towel and line a regular colander. Voila! It comes in 2 forms: the one displayed above and red variety – both are equally delicious. 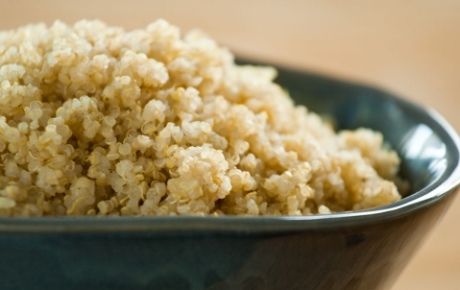 Always cook quinoa in a 1:2 ratio where if you’re preparing one cup of quinoa, add 2 cups of water or veggie broth. Broccoli, parsnip, carrots, onions, acorn squash and sweet potato. I preheated the oven to 450F, chopped (and peeled some) veggies, cut and put them in a baking dish. Toss with some olive oil, salt and pepper and place in the oven for between 20 – 40 minutes (depending on the vegetables you use) – 1/2 that time I had them covered in foil, the other 1/2 was uncovered. Meanwhile, prepare your quinoa by stovetop, in a medium pot over medium-high heat, combine rinsed quinoa and water/veggie broth. Bring to a boil, then cover and let simmer for another 15-20 minutes. I also add one clove of minced garlic to my quinoa while it simmered, just for some added flavour. If the quinoa is ready before your veggies, no worries, remove from heat and leave covered until veggies are ready to be served. Once everything’s ready serve away – and no one’s judging you by how many veggies you take, so make a huge mound! This honestly is SO easy! 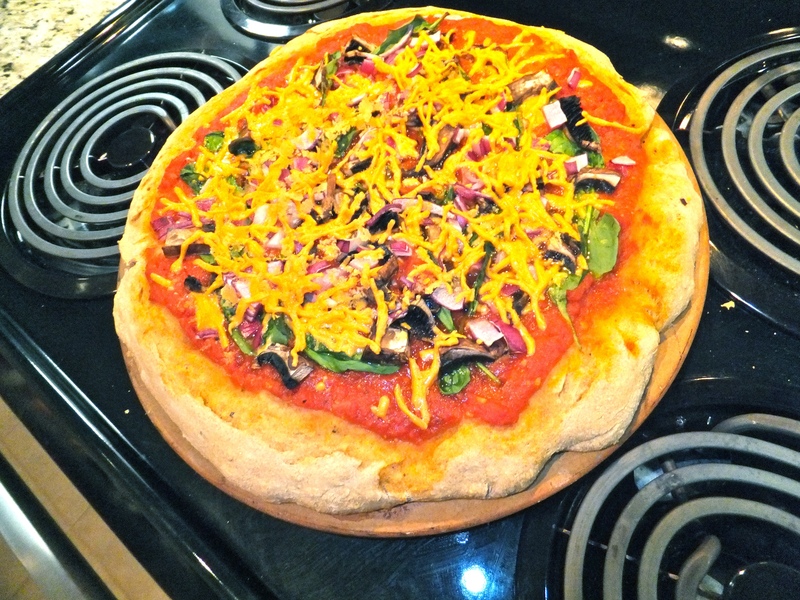 I chose this because sometimes it’s fun to make homemade pizza! If you don’t want to use dough, I suggest using pitas; they’re small and so easy to use as a base for pizza. If you are opting to make your own dough, this is the recipe I used. Also, prepackaged pizza sauce makes it really easy as well, but for homemade ones as long as you have the basics like tomatoes and herbs you can pretty much make your own. Plus, there are a million on the web, if you don’t have your own! Veggies – you can go veg crazy here. Pick and choose what you like – this is where the pitas would come in handy for individual servings and choices! The vegan cheese: I know this is the scary part. I’m not going to sugar coat it…it’s not like regular cheese. Having said that, when you do officially give up cheese and haven’t ate that stuff in a long time, this begins to taste like your old friend dairy cheese. It’s not as horrible as it sounds. The husband likes it and he’s part of my peanut gallery. 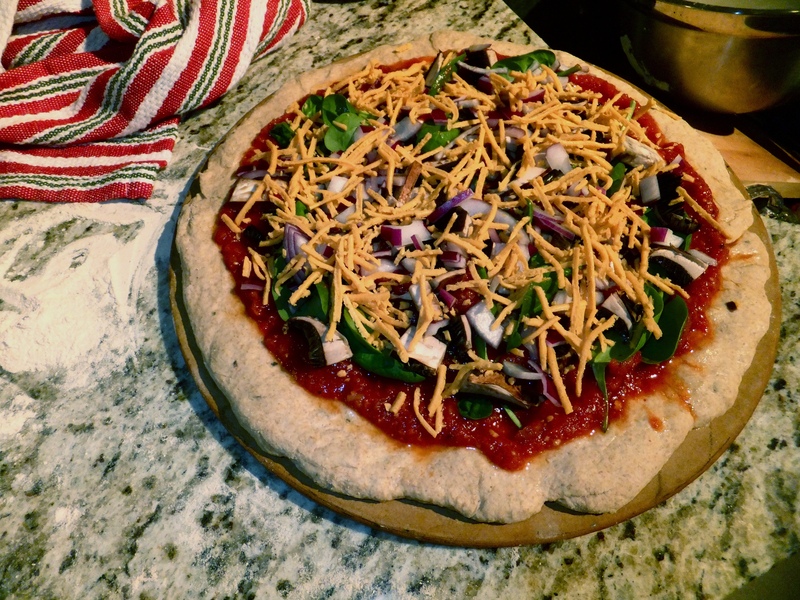 I don’t eat a lot of vegan cheese to begin with, but I do like it on pizza and nachos the odd time. If you do want something else that resembles cheese, I suggest sprinkling on some nutritional yeast. 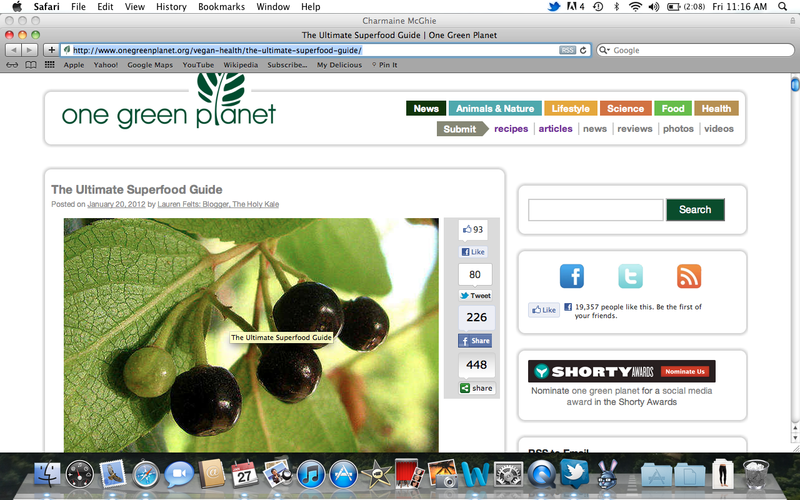 It is a vegan’s best friend (which I will cover in another post – or for now, google it!) and no joke, it seriously is one of my best friends. There you have it; some very simple yet delicious meals for this week. And here’s a preview of things in store for next week! First things first, the best thing about today so far is me skipping school like I’m some sort of rebel. Ok, I really am not. I would have very much preferred to be at school, but the roads were just not letting that happen today. After 10 minutes of my husband basically ice-picking my windshield (because that’s how caked on the ice actually was…no lie), and me driving for 5 minutes, I said F this, turned around and came back home. I’m still battling with my goody-two-shoes (did I get that right?) self to just accept that I won’t have the lecture notes for today – probably better than me ending up in a ditch on the way to school. Finally ordered a full length pair of wunder unders – they had some in clearance (or ‘we made too much’ as they like to call it) for $59 – done and done! 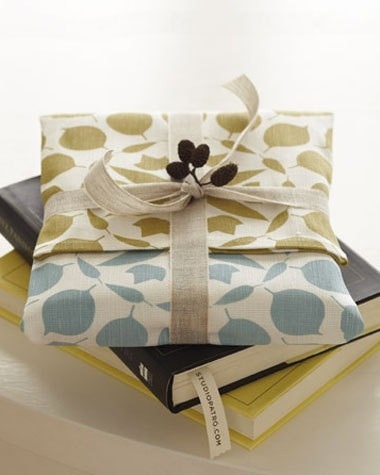 You can’t go wrong with cookbooks wrapped in tea towels. A list of some pretty fantastic foods, if you ask me! Something I need to get my hands on ASAP! I swear it’s been smacking me in the face since yesterday! It’s like the instance of when you think about someone that you haven’t seen in a long time, and then you happen to see them…weird, right? 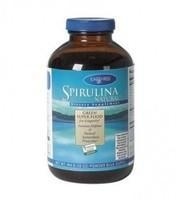 Well spirulina is trying to tell me something – it wants to be friends! Absolutely loving BodyRock…you really have no excuses for not doing these workouts. They’re adaptable and great…and make you nice and shweaty! Just cherish every moment – especially when the road conditions are bad and you never know what could happen. That was the inspiration for my word! And on that note, I’ve decided I AM going to go to school for my remaining 2 classes (can you tell this blog post has been in the works for a few hours now lol). The snow has stopped and the roads have been cleared, so now I can go and learn like my little mind would like to do! What are your Friday favourites?!?! 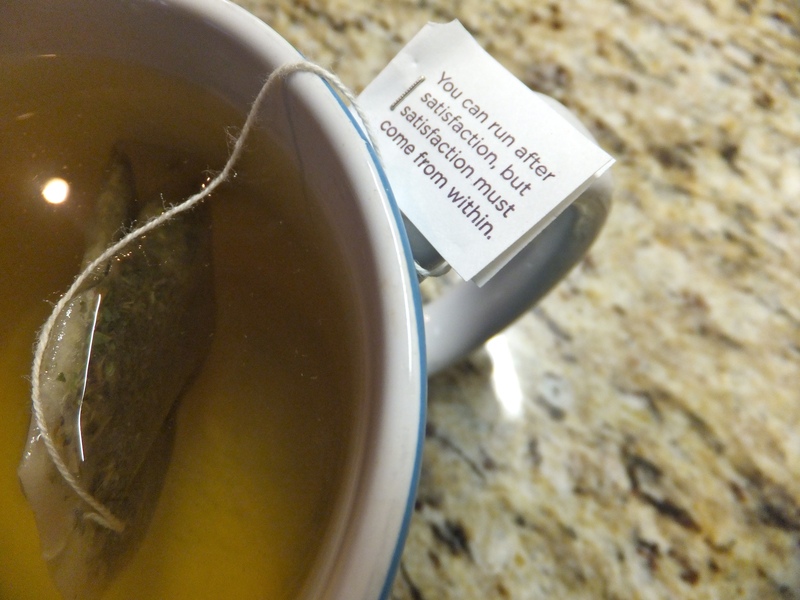 A good morning start is with inspiration in every tea bag (no joke). I also wanted to share my hair inspiration from the other night. 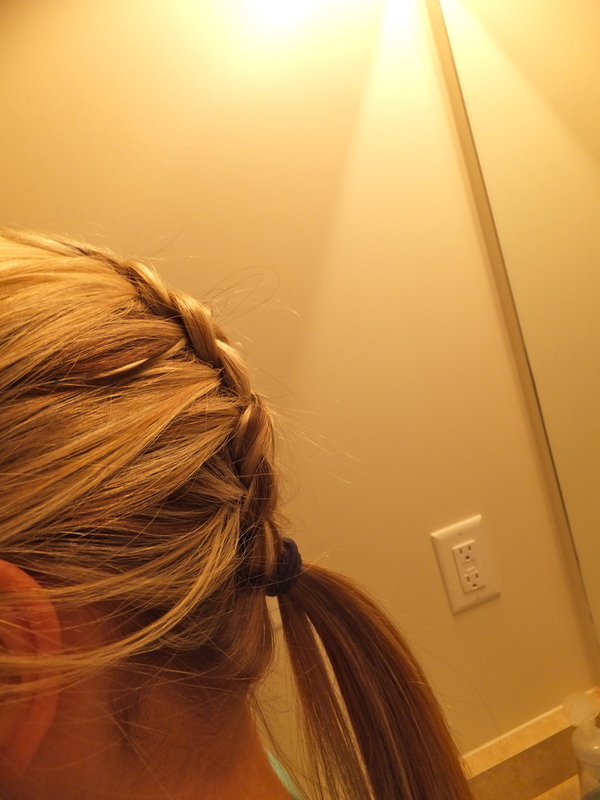 Although I now associate this hair style with sweet, torturous pain (a la CrossFit), I’m sure good memories of it will resurface one day. 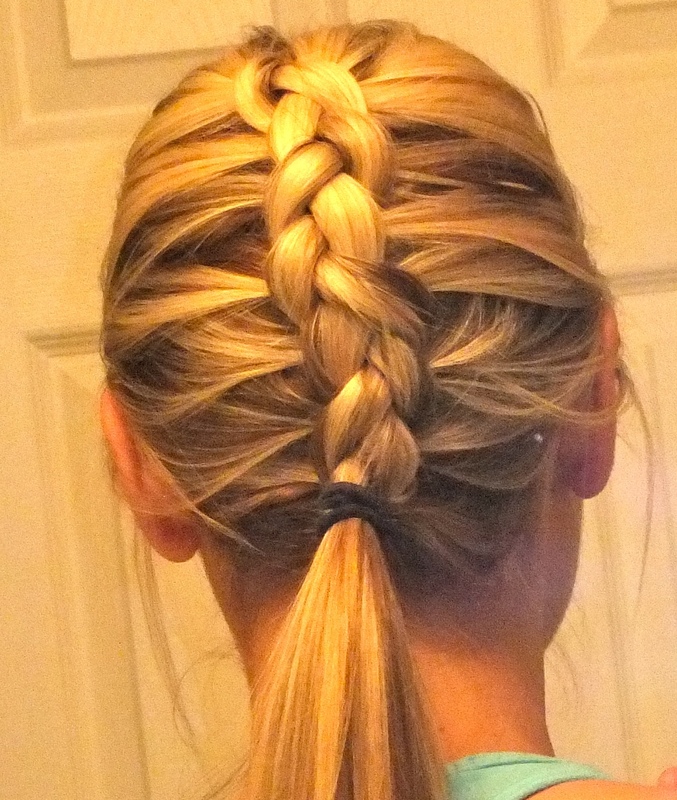 This was not a perfect rendition of the braidtail, but I’m pretty sure you get the idea of what it should look like, had I not failed to do it straight (read: I had to rush out the door to pretty much get slapped around in the gym). I think next time I’ll do it on an angle so I can have it over one shoulder. 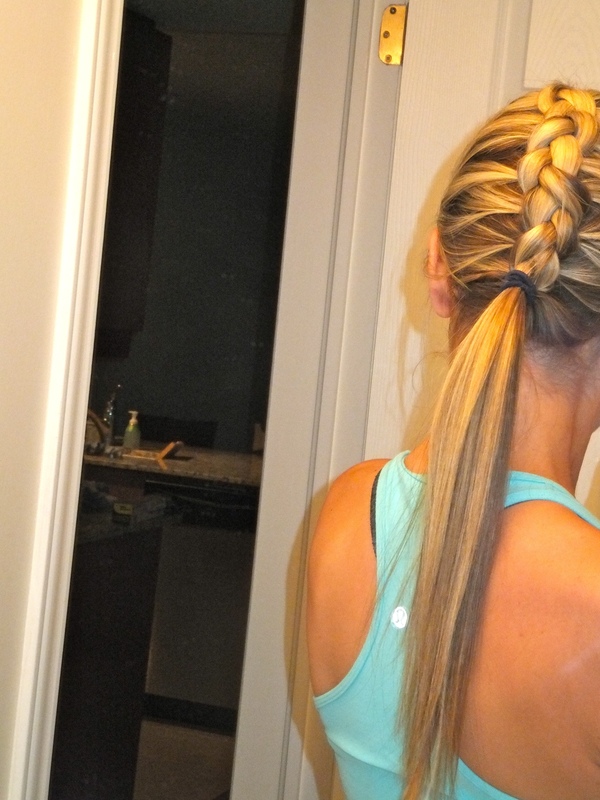 You too can wear this very nice braidtail and use it after your workout to dry your tears. Comes in pretty handy now, doesn’t it? Katie had posted this really cute zebra video (which I now have the song stuck in my head #thankyouverymuch), so I wanted to post a youtube video as well, just to prove how cool I actually am, too. The husband and I watched this one last night and although it’s not a funny situation, I was laughing to the point of crying. I’m sorry to all the people who actually were in this video. May your cars RIP. Side note: I promise you I’m not a horrible person, but I was a little overtired last night and could have very well been the reason why I was laughing. And finally, one last thing. If you’re a non-dairy milk lover, is this something you will be trying?! I’m sure it will take one billion years to make it’s way to Canada, but when it does, I will be inline to try it! (psst, it’s flax milk in case you didn’t click the link). 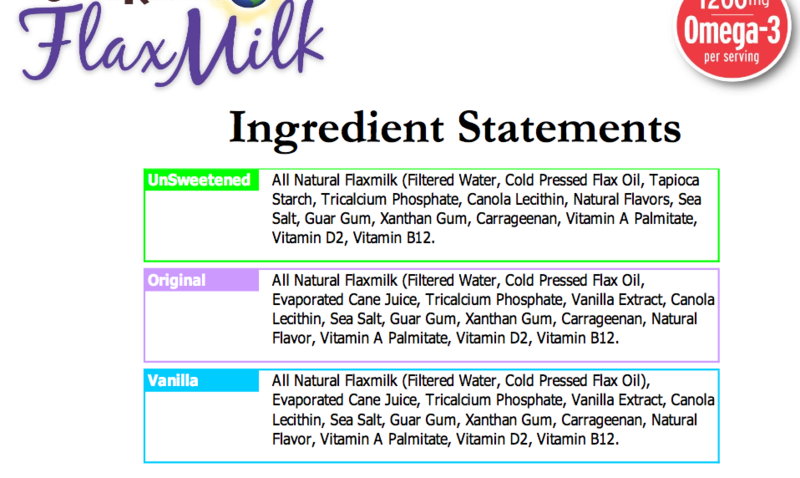 Here is the ingredient list for the three different flavours of the flax milk. Another side note that’s very important: I do NOT recommend males drinking this type of milk since it has flax oil in it opposed to flax seeds. Flax oil (unlike the seed) should not be consumed by males, since it has been positively linked to enlarged prostate. I’m hoping the flax milk might make it on there one day! Those are my Thursday thoughts. Have a great day! Missed week 1?? Check it out here. Find out how the once a week vegan challenge works here. So it’s week 2 and I am going ethnic! I have three new meals that are – wait for it – super easy. They’re also pretty tasty and can be mighty spicy if you wish them to be (let’s just say, we’ve turned the heat up a notch, and I’m not talking about the thermostat…this time). These ones are particularly great because they can be lunch or dinner options – we’ve used them all for both :). And if the husband says, “I really loved that,” then I know it’s good and worth sharing. I think I’m ready to let you in on the ethnicity options…here we go! Don’t think you’ll like this? Jump to recipe #2! 2 tbsp molasses –> great source of iron! In a small sauce pan over medium-low heat, add the first 1/4 cup of water and peanut butter. Once combined, add remaining ingredients, leaving water until the end and adding as much or as little for desired thickness. In a large pot, boil water and cook pasta according to directions. Once complete, drain, rinse under cold water and set aside. 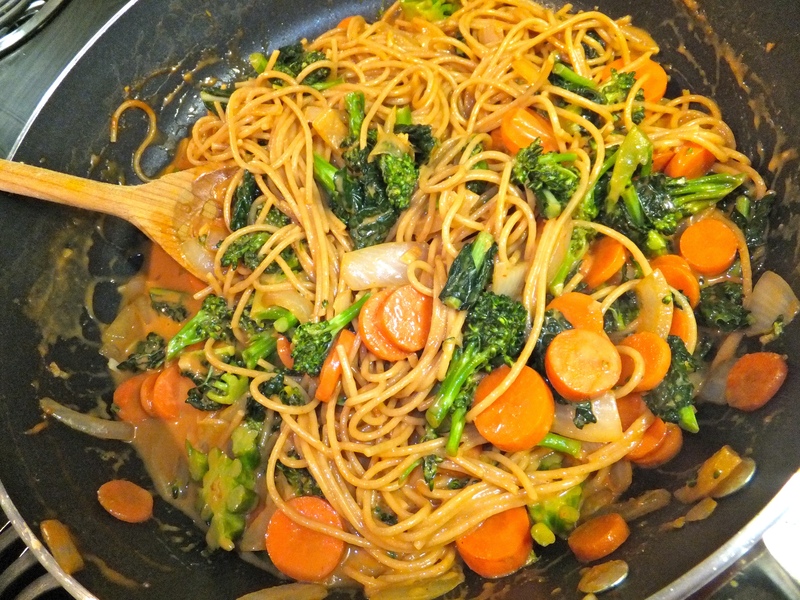 In a large frying pan over medium-high heat, once heated add canola oil and then broccoli. Let broccoli cook for a few minutes before adding remaining ingredients (ginger, garlic, fresh veggies and tamari/soy sauce). Cook for as a few minutes if you wish to keep veggies crunchy. Add the completed sauce to the frying pan, along with the noodles and toss. 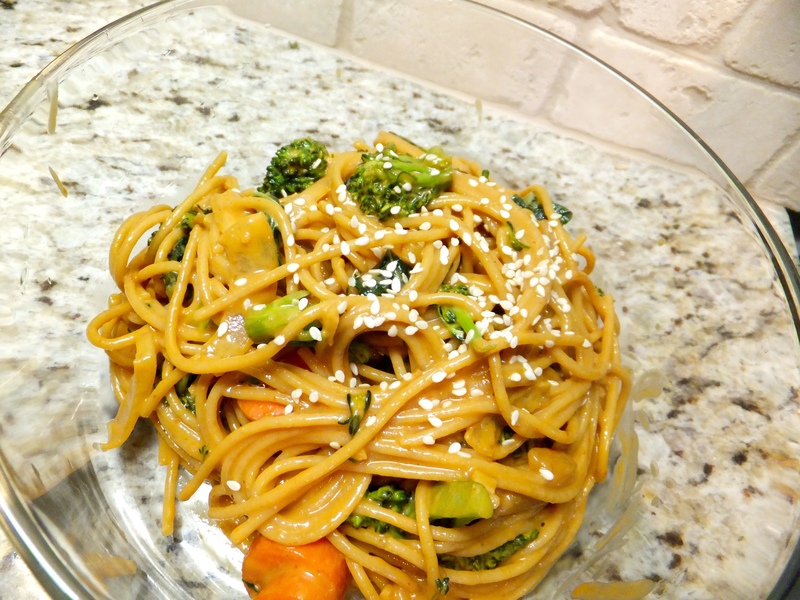 Once everything is tossed together and coated, add (optional) sesame seeds and serve. We literally just tried this one out today and it was so flavourful and delicious. I personally liked the adjustments I made to the original sauce, as the original one just lacked in flavour. But, if you’d like to follow the original recipe, totally go for it! 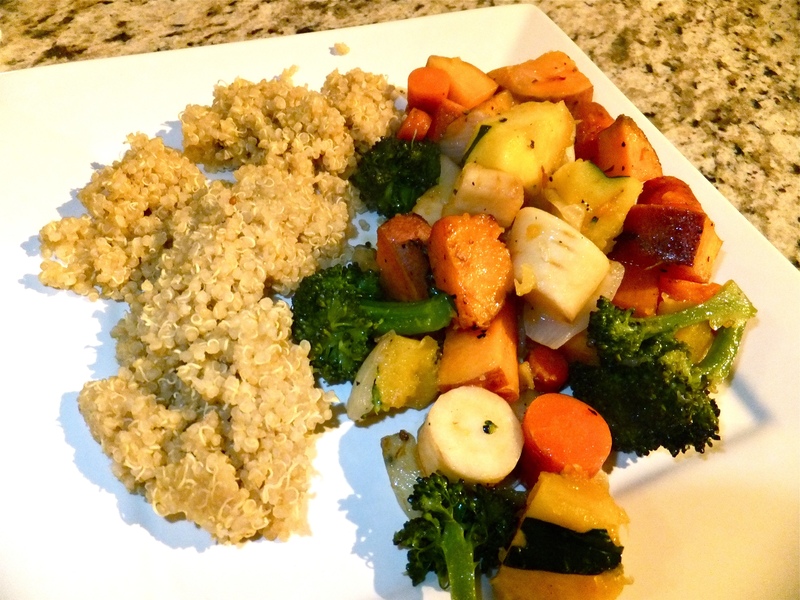 If you are looking for that super easy dinner meal, this would be it! Very little prep time and easy to make with whatever is in your fridge! If you’re not a curry lover, jump to recipe #3. 5 cloves of garlic, minced –> no vampires tonight! In a deep frying pan (one that can be covered with a lid), heat oil over medium heat, add onions and cook until soft. Next, add in the chili pepper, ginger, garlic and cook for another few minutes. Next, add the spices – you will end up with a paste. Add the chickpeas and sweet potato, plus enough water to cover everything (about 3 cups), and bring to a boil. Once boiling, reduce heat and simmer, covered, for 45 – 50 minutes – stirring occasionally. Liquid should start evaporating and is done once it thickens. 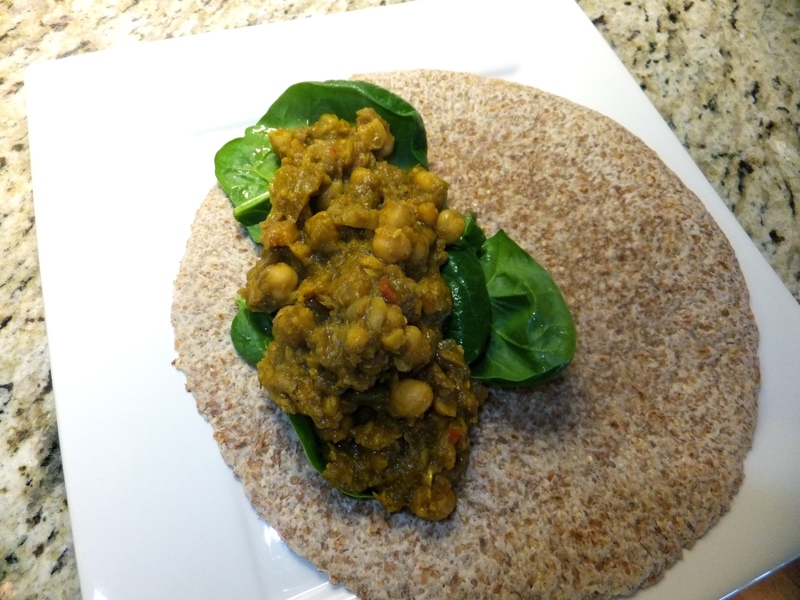 Warm a tortilla, place spinach in wrap and top with a scoop of chickpea mixture, and wrap. If I could remember what the name of the pepper was that I used in this recipe and you loved spice, then perhaps I’d be a little more useful – but holy, was it hot! Thank goodness for the wrap and spinach to calm it down a bit, but even then, not that much! On the other hand, if you do not like spice or like minimal, then control the amount of spice by just adding red pepper chili flakes at the end, more custom to your spice tolerance. I really enjoyed this recipe, and actually heated up leftovers the next day to eat over salad, which turned out quite good, too!! Nice combo of flavours and also a nice ethnic change! Where would I be without one soup?! Especially my own soup recipe!! It’s one of those good meals you’re looking for that’s quick and easy, too. Minimal prep and even minimal to do while it cooks away. Cut the squash in half, scrape out seeds and do your best to peel that skin off (it has deeper grooves so requires more work, and if you can’t get all the skin, it will be a-okay). In a medium-large pot over medium heat, add a splash of olive or canola oil, add the garlic and onion – saute for 5 minutes, until tender. Add the cubed squash to the pot, along with the liquids and spices (hold the salt and pepper until it’s time to serve). Bring mixture to a boil, then reduce heat and simmer for approx. 30 minutes. Once the squash is tender (test it with a fork pierce! 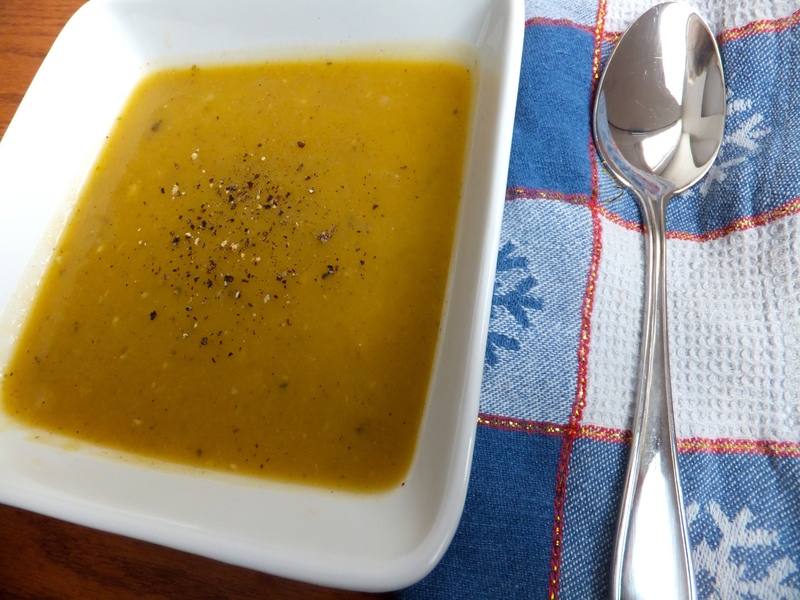 ), remove from heat and either leave the soup chunky or use immersion blender to puree. It really is that simple and – trust me – totally worth it. 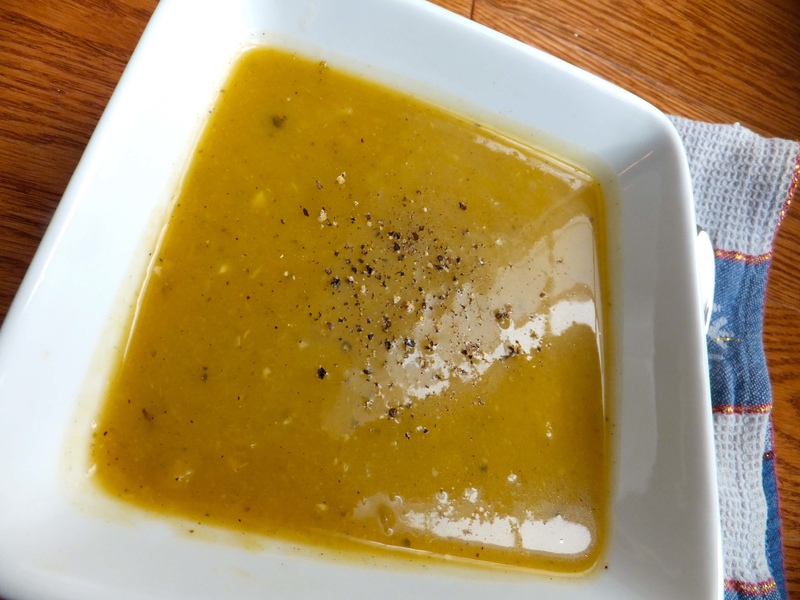 I don’t know if it made a difference using an organic squash, but the flavour in this soup was spot on. And there you have it – another week complete. If none of these recipes appeal to you, and you missed out on week one, check out them out here! Going vegan wasn’t hard – I could care less about if I ate cheese again, had a sip of milk or ate some kind of meat or egg. Those were all easy. It’s the what people say that was the hard part. I wasn’t quite sure if I had armed myself with enough facts for when the different questions did come up. But, you know what? People will always talk – it’s inevitable, whether you answered the question flawlessly, or not. They’ll mainly talk because they’re scared of something new and different or because they’re in denial…or maybe they just don’t know all the facts. And lucky for you, that’s not on you in the least – so you can choose what to do next! The most important thing that you can do to defend your case is stay levelheaded and don’t let anything get to you – which is sometimes what people intend to do. Just remember: it’s because they’re scared!! And think about it this way – if people are asking you such detailed questions hoping you won’t have a valid enough answer for them, just put the idea in your head that they’re asking you these questions because they care about you. They want to know how you get your protein, calcium, vitamin B12 and iron because they actually truly, deeply care. Whether it’s true or not, by thinking that way, it might help produce an answer that may actually wow that person – and that flawless answer you never intending to speak, comes out naturally. Besides all this, if this is what you believe in, do you really care what people think about it anyways? Would you change your ways because someone believes that beans aren’t a complete source of protein and that you’re lacking in key nutrients (when you really aren’t)? If the answers are a strong no then you’ve already looked past what people are saying. Always remember, through the battles you will encounter (and yes, there will be battles!) regardless of if you stretch yourself thin to defend your case or put up a brick wall – people will talk. It’s inevitable. So what are you going to do for you to make their talk not matter? My name's Char and I’m a 25 year old girl who’s determined to live an awesome and healthy life by following good nutrition, workout plans and life choices. You can follow me here as I continue on this mission!